If you’re a busy parent, worker, manager, business owner, or (INSERT TITLE HERE), you know that things can get hectic quickly. Let’s not even talk about if you’re some combination of the titles above such as a parent and business owner. In no time at all, your schedule and the schedules of those around you can get so tangled that you’re triple booking yourself, getting people mixed up, and generally living in a haze of confused chaos. No fun! In an effort to simplify my own life, or at least maintain a shred of sanity, I created this free printable work schedule. Keeping track of employees’ schedules. Whether you manage employees at a physical, brick and mortar location (for example a restaurant) or virtually (for example freelancers), the printable work schedule can help you keep track of everything. You can track shifts, meetings, or due dates with ease. Simply write names in the left hand column and times, check marks, or little notes under the appropriate day. 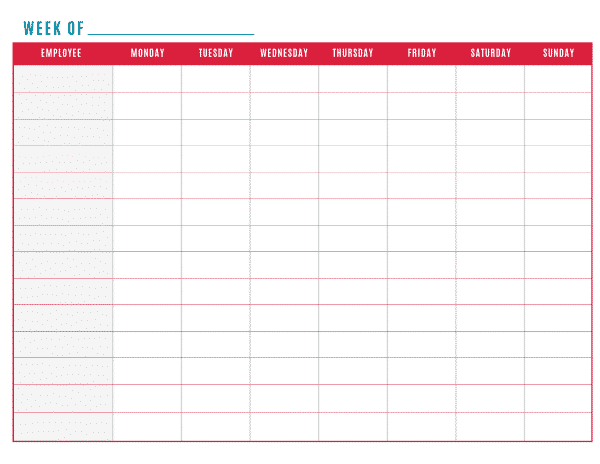 You can also use this printable work schedule to keep track of vacations. This is a great (and easy way) to know who is out of the office when! Keeping track of work being done. Do you have multiple individuals who work at your house, such as different babysitters for your little one? If so, keep track of who will be at the house when with this handy printable work schedule. If you’re doing renovation, this printable work schedule is also a great way to make sure too many people aren’t overlapping and that you or your spouse will be around when repairs are being made. Keeping track of your schedule. Write down your own schedule including meetings and due dates and keep the info at hand with this free printable work schedule. This sheet is an easy way to keep track of what you’ve got going on including tasks you have to repeat on a daily basis. For example, instead of writing employees on the left hand side, write down repeatable tasks such as taking vitamins, checking email, working out, posting to Facebook, etc. and then check them off each day as you complete each one. This printable work schedule is great for keeping track of your child’s homework and test schedule regardless of grade level. Instead of employees, simply write teachers’ names or subjects in the left hand column. Many schools give kids homework planners, but this printable work schedule can be pinned on the fridge for reference anytime since your child will likely have his or her homework planner somewhere in the black hole of their backpack. Last but not least you can use this printable work schedule to keep track of chore duties whether you have one kid or 12. Write names under the employees column and then what needs to be done (ex. trash, sweeping, dishes) under the desired day. Stick the printable work schedule (er, chore schedule) to the fridge so no one can claim they didn’t know what they were supposed to do. If you’re busy, and who isn’t, you can use this printable work schedule to help keep your schedule manageable. Whether managing employees, yourself, or your children, this printable can help! Download your Free Printable Work Schedule now. Want more freebies and awesome printables like this printable work schedule? Follow Freebie Finding Mom’s Freebies Pinterest board. 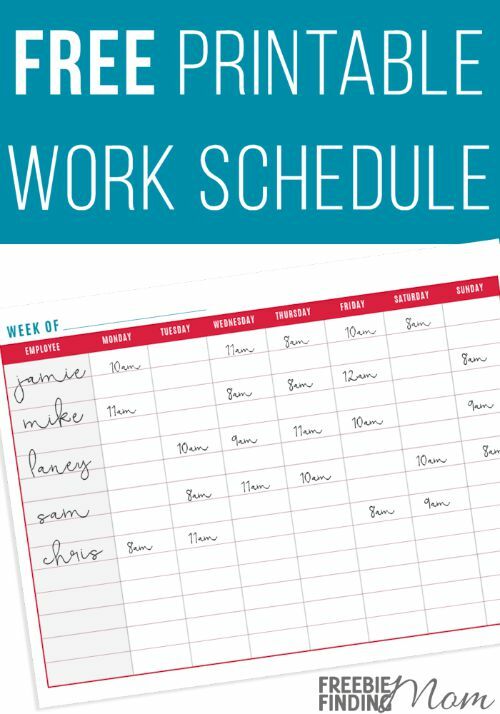 What other uses have you come up with for this printable work schedule?